It seems like nobody noticed (except of course the developers) that Link's newest adventure has a multiplayer mode. Too busy paying attention to trains and a ghostly Zelda along with Link for the ride, I guess. 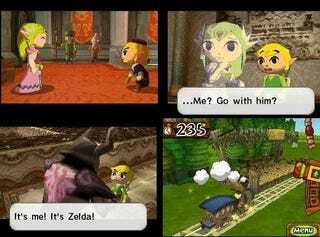 The Legend of Zelda: Spirit Tracks' multiplayer mode is akin to The Legend of Zelda: Four Swords Adventures for the GameCube – four people each control one color-coded Link and move around the same map as the other Links. The difference in Spirit Tracks is that instead of trying to help each other, you're racing each other to collect Power Gems and trying to royally screw each other up on the way. I played two matches against a developer and two publicists at Nintendo's Redwood City office after finally getting my hands on the singleplayer mode. Spirit Tracks it out December 7. I was playing on a normal-sized cartridge that may have been a final version. Little Bit Laggy: When dashing around the dungeon map, things start off steady and the Power Gem drops are few and far between. As the match picks up pace, however, and players start falling into traps or getting sliced up the Phantoms, huge amounts of Gems will suddenly spill out onto the map. That plus all four players frantically running to that point to scavenge Gems caused a couple of super-laggy moments in an otherwise smooth experience. Trap Door Confusion: There are trap doors in every map that are either random or triggered by switches. I honestly couldn't tell you which, though, because sometimes I'd press a switch and a trap door would open and sometimes the door seemed to open and shut in a kind of rhythm. It was confusing – and that much more frustrating when I fell into one because I didn't know if I should blame somebody for it. Spreading The Phantom: Numerous Phantoms – those big guys in helmets from the last Zelda DS game, Phantom Hourglass – wander the maps, prowling for Links. When one spots you, a little icon pops up above your head, indicating that it's got a bead on you. If you fail to run for your life, the Phantom will speed toward you and cut you – costing you precious Power Gems and precious seconds as you scramble to get up and recover them before the other players get there. The fun part about this mechanic is the bit where you can pass the Phantom's bead onto other players you run by – like spreading Chlamydia. It's amusing. The Invisible Zone: One map we tried out had a patch of water in the center that rendered players invisible when they ran in. You could still see ripples where their feet landed in the water – and if you look closely, the ripples are color coded like the Links – but with all four players running around in there and Phantoms bearing down on one or more of them, it was blind panic. And freaking awesome. Mario Kart-style Pick-ups: Occasionally, an orb with a question mark on it will fall from the sky. Players that snag this pick-up are treated to several things like a random Gem drop, invisibility or a lightning strike that you can inflict on other players. It keeps things interesting and can be the salve to the wound of a player who just went from 51 Gems to two after a string of Phantom infections. Single Cartridge Play: I am so happy that it doesn't require four people to actually buy the game to enjoy this mode. The multiplayer mode in Spirit Tracks certainly isn't the main attractions of the game – but it's a solid addition that deserves to be played if you can tear yourself away from trains and princesses for a little while.